On the 6th of February 1911 there was delivered a bouncy baby boy by the name of Ronald. This was a man who was set to change the world in ways that few could imagine. To some he was a hero like to another, to me and many who know what he did, he was a villain. When I wanted to write about this, I wanted to do a slight rant about how his record was filled with bigotry and hatred towards everybody who wasn’t a straight white male. But all of you know about his opposition to the civil rights movement, his blanket opposition to Gay rights, and his almost genocidal avoidance of acting on the AIDS crisis for 6 years. You know all of this, and me showing him for what he was wont change a thing. This article was going to be full of righteous bile, but I was re-watching an episode of Smallville while writing, where Oliver Queen talked about “Armchair Bloggers” who just complain about the world and do not fix it. Its true, I’m no David Kato, I’m no Stonewall Rioter, I’m not even a member of the Queer Liberation Front. I don’t know how to save the world, I still find it difficult to save myself at times. But, I’m me, I’m still here, and I’m looking for ways to fight and I’m speaking. Maybe its a fool’s errand, maybe the pessimists are right, nothing ever changes for the better. Sometimes in my dark moments I believe them, but then I remember something extraordinary. In 1945 US troops marched into concentration camps across europe, releasing all the groups of prisoners, but one. Those who wore the pink triangle, they were dragged out of Nazi prisions, and thrown right into American ones, to suffer for being true to who they were. A few weeks ago, a law was finally passed that said the revolutionary idea that if you are gay or lesbian you have a right to serve your country in the military. Now yes I know its utterly incomplete, and unimplemented, but things change. Next time that the US military marches into a tyrannical situation, it will contain out and proud members of a caste of formerly repressed people. That same military’s predecessors would have been the ones arresting and brutalizing. So don’t think you can sit there in a cloud of pessimism and woe, smug and self satisfied that the world never change, because the history of the world is one of improvement and hope. 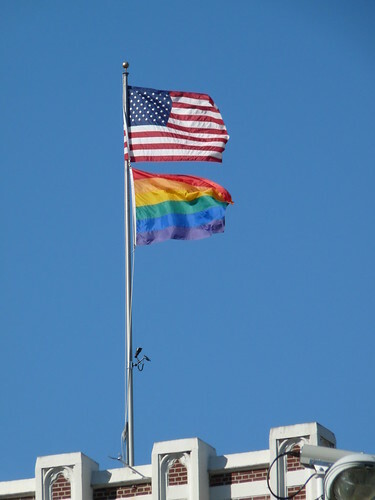 I often see the American flag hung next to the rainbow flag, and slowly but surely that sullied flag of false dreams is earning the right to be hung next to the rainbow. There is an American phrase about giving our children a better life than our own. Our forebears stood up for us to make it possible for us to be out and proud in a way that they could not in youth. Just by living we honor their example, but we can do more, we can give our children a more open freer better world than the one in we live in. Of course it will not be plain sailing, and Reagan’s stepchildren are still looking for ways to change the world back to his way of thinking. Palin, Huckabee, and others will always appear, evil never goes away, but we can keep fighting and keep pushing it back. Who among you will listen to the mad dreams of a foolish, idealistic woman… I believe in you… please believe in yourselves and make a difference.